Hello from New Orleans where the 2011 NCEA Convention & Expo is taking place. It’s been awhile since I’ve been in New Orleans, and not since the hurricane struck here several years ago. It is good to be back in a city that is widely known for its Catholic roots! On Wednesday, April 27th I will give a professional development session – The Digital Age Catechetical Leader – to the National Association of Parish Catechetical Directors (NPCD). To begin the session, I will invite all to respond to a simple sentence stem – A Digital Age Catechetical Leader is one who…. Since I’m writing this before the session I’m eager to hear how you and the participants will respond to this. The session participants will be invited to come to this blog post to share their insights. I’m looking forward to the ongoing conversation. In this period of time, where we are being faced with massive changes in communication and learning opportunities, we are needing to learn new skills and then to train our catechists in evolving methods that involve not just the pencil or blackboard or books or email or whatever we are most comfortable with. We now need to learn how to use digital tools like – electronic whiteboards, computers (desktop, laptop, or mobile), iPads, and the many Web 2.0 tools – to teach the faith and to evangelize the larger world. In my presentation I invited the participants to keep in mind 10 Points for Digital Leadership. 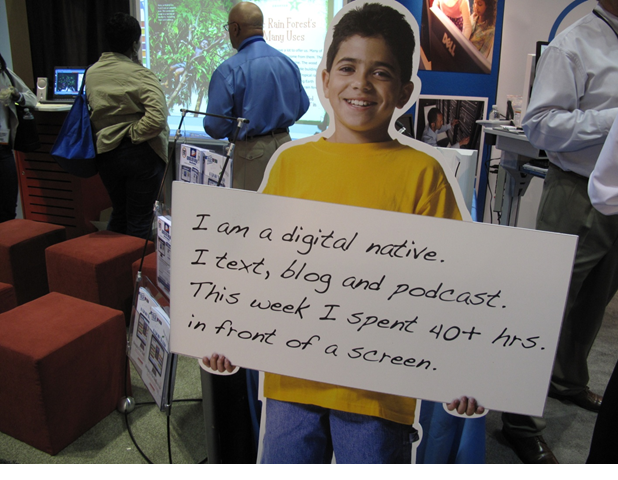 Come and visit the presentation – A Digital Age Catechetical Leader. I’m trusting that we will continue the conversation, as we are learning “inch by inch” what it means to be a Digital Age Catechetical Leader. If you were part of the NPCD/NCEA professional development sessions please continue the conversation here. If you are one of the many who visit this blog on a regular basis, you are also invited into the conversation.